The sun may have shone at Glenpark at the weekend but it failed to bring out the best in Greenock's performances. On Saturday, they were bowled out for 119 by Hillhead who then overtook that score for the loss of just 2 wickets. Sunday's visitors, West of Scotland, also won convincingly. After bowling Greenock out for 84, they wasted no time in winning by 7 wickets. Work to do before next weekend. Our regular reporter, Peter Hempsey, was on hand to watch the games and presents his view of the action in his weekly report. The series of pre-season friendlies continue this weekend when Hillhead and then West of Scotland are the visitors to Glenpark. Greenock will be able to field a stronger team for these matches than for last weekend's matches with new overseas amateur, Zac Barrenechea, featuring for the first time. Professional Saurabh Bandekar has yet to arrive in the country with fingers crossed that arrives in time for next weekend's start of the league campaign. Skipper Neil Flack will be looking for a strong show from his squad of players as they gear up for the competitive season. Play will start at 1pm on both days and the forecast looks promising with temperatures predicted to be higher than those of last weekend, not that that would be difficult. Greenock started their 2019 season in fine style on Saturday when they gained the easiest of victories over Renfrew. Renfrew batted first and set the tone for their innings by losing two wickets in the very first over. Nobody reached double figures as they were bowled out for just 32, Sammy Sanghera and Sehmat Pandher each claiming three wickets with Rod Mountford with 2 and Neil Flack with 1 being the other successful bowlers. In reply, the Pandher brothers both fell cheaply but skipper Flack was unbeaten as the target was knocked off in less than 8 overs. A brief report on the action can be read here. The Hillend XI played a friendly with the West of Scotland 3rd XI (Hamilton Crescent) on Sunday and came off second best. A young and inexperienced side struggled against their older opponents and could only muster 78 when they batted first. West overtook this total without losing a wicket but play continued for a while to enable more players to get match practice, with West eventually finishing on 141 for 3. The 2019 season league season starts in just over three weeks time and our roving correspondent, Peter Hempsey looks ahead to what is in store over the summer months at Glenpark. The March monthly draw for the Glenpark Supporters Prize Draw (GSPD) was made on Saturday 30th March by Archie Wohlgemuth and the four lucky winners were Alistair McMillan, Robert Robinson, Dave Sharma and Enid McDonald. The next draw will take place on Saturday 27th April for the usual prizes and at the same time the April jackpot prize will also be drawn. We are always looking for new members to join the draw, the receipts from which are used to improve the facilities of the Club for all members. If you wish to join, please contact Brian Papworth at the contact details to be found at the Contacts link at the top of this page. Word has reached the Club that Barry MacLean has sadly died at the untimely age of 43. Barry played 71 times for the 1st XI, mainly as a late order batsman, between the years of 1990 and 1997. 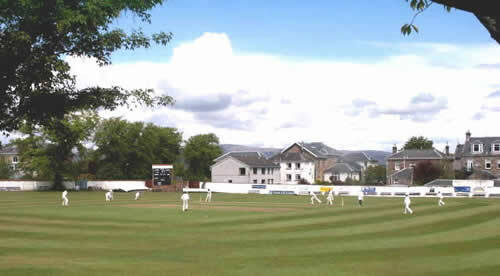 The 1st XI have been given a home draw in the Murgitroyd Rowan Cup and will play Clydesdale on Thursday 23rd May. The McCulloch Cup draw sees Greenock in the same group section as in previous years and they will play home and away ties with Ferguslie, Kelburne and Renfrew. The Glenpark XI have four qualifying games in the Western Cup, starting with away ties at Dean Park and Whitehaugh before playing Vale of Leven and Meikleriggs at home. These games will all be played on Tuesday evenings. The January monthly draw for the Glenpark Supporters Prize Draw (GSPD) was made on Saturday 26th January and the four lucky winners were Alice Loftus, Colin Lochhead, Emma Norris and Dave Sharma. The February winners in the draw made on Saturday 23rd February were Jack Thomson, Stewart Robinson, Wilson Evans and Kenny Love. The 2019 season is approaching fast and it is now time for pre-season preparations to take place. St Columba's school in Gourock has been booked for 5 weeks starting on Monday 4th March with each session starting at 7.30pm and lasting for 2 hours. The fixtures for the 2019 league season have been released and somewhat belatedly have been loaded on to this site - see the links on the right-hand side of this page. The 1st XI start their campaign on 27th April with a home fixture against newly-promoted East Kilbride and will then play the other promoted side, Drumpellier, at Coatbridge on the following Saturday. The season ends with a visit from Poloc on Saturday 24th August. The Glenpark XI, after their relegation last season, will play in the 9-team Fourth Division and they start their season with an away fixture against Glasgow South. Their final game of the season will be a week later than that of the 1st XI when Kingholm will be the visitors to Glenpark. As well as fixtures against two local sides, Inverclyde and Bute County, which are sure to be keenly contested, the team will have to travel twice to the South of the country to take on Kingholm and Galloway 2nd XI. A rather unwelcome feature of the season is the fact that there will be two Saturdays when there will be no game at Glenpark - 22nd June and 10th August. No doubt the weather on those days will be warm and sunny!! All members and friends of the Club will be extremely saddened to hear of the recent deaths of Randal McLean and Jack Thomson, both long-standing members of the Club. Randal was an ex-Treasurer of the Club as well as being a doughty left-handed opening batsman for the 2nd and 3rd XIs for many years after he joined the Club from Phoenix. He captained the 3rd XI on many occasions and after giving up playing, he was a regular attendee at the Club and faithful supporter of all the teams. Jack was the oldest surviving member of the Club until his recent passing in his 98th year. He played for the 1st XI after the war as a hard-hitting and forceful batsman and was a member of the 1952 team that won the Western Union Championship. Our sincere condolences go to the family and friends of both Randal and Jack. They will both be missed at Glenpark. 2019 Scottish Cup draw - and we've got a tough one! The draw for the 2019 Citylets Scottish Cup has just been announced and it has not been particularly kind to Greenock who have been drawn AWAY to cup-holders Grange in the first round. The tie will be played on Sunday 9th June with a reserve date of the following Sunday. The squads for this winter's Western Warriers youth training have just been announced. Lukas Fischer-Keogh has been awarded a place in the Under-14 squad while brother Sean will take part in the Under-16 training and Emily Norris has been selected for the Women's Under-16 squad. Congratulations to all three who now have the chance to further their claims for selection in the coming season's representative matches. At last night's Annual General Meeting, the members unanimously elected Sir Robin Duthie as Honorary President and Jack Clark as Honorary Vice-President. Committee roles stayed the same with David Glancy continuing as President and Neil Flack captaining the Club for a second season. All members and friends of the Club will be extremely saddened to hear of the sudden death on 5th October of Hugh McClure, ex-President and long-time supporter of the Club. Hugh will be sadly missed by everyone connected to the Club. Our sincere condolences go to his wife, Joan, and his family. The Club is delighted to announce that Saurabh Bandekar has signed a contract to play a second season as professional in 2019. Saurabh was a big influence on our play in 2018 which culminated in an eighth-place finish in the League, a terrific result considering we lost the first four games of the season. We are certain that Saurabh will build on his performances and lead the Club to success next season. The Club also expects Laurens Smit to return again in 2019 as our Overseas Amateur. Laurens too had an excellent debut season and we fully expect him to build on this for 2019. Everyone at the Club will be delighted to see Saurabh and Laurens at Glenpark next season.